“There were two kinds of monsters, the kind that hunted the streets and the kind that lived in your head. She could fight the first, but the second was more dangerous. 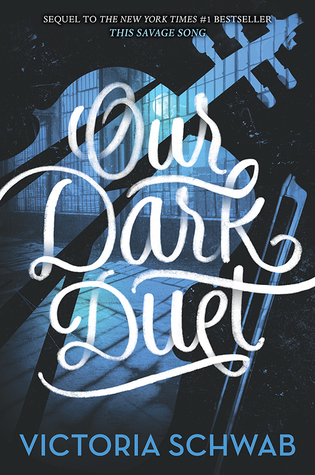 I'll admit, I picked up Our Dark Duet with rather high expectations. I enjoyed This Savage Song, but I wanted Schwab to push the boundaries of her story a little more. I wanted to see what made her characters tick, what lengths she could push them to. I loved how all of her characters embodied so much grey and walked the line between good and evil, and I wanted to see her explore that theme in its entirety. So, the question is, did she? Yes and no, if you ask me. This second novel picks up six months after the first and expands outside of Verity's walls and into Prosperity, where Kate now spends her days hunting monsters and working at a coffee shop. How does she escape school at the ripe age of seventeen? Not sure, but I digress. Kate is undercover and August has taken over as an FTF leader in the fight against monsters in Verity. August is definitely different, and I think Schwab started to tap into the depth of his character. However, just as I was really starting to feel like we were getting somewhere with him, Schwab whisked us off into action-packed scenes. I wanted a little more, and I think his development was left a little unfinished. Kate is... Kate. Like I said in my review of the first book, I could take her or leave her. She doesn't really change much in this book, so neither does my opinion of her. Schwab's monsters are created by the sins of humans, and I find that absolutely fascinating. I mean, just think about it. It's utterly brilliant! Violence begets violence and whatnot. That theme in itself is enough to make me nod my head in approval at this book. Honestly, I'm a little surprised that I've never stumbled across this concept before in my reading. I've been trying to put my tongue on what bothered me about this sequel, and I have really, really struggled. The best way I can explain it is to say that I think Schwab could do so much with this world and these characters. I think she limits them by sticking them in too many action scenes and by reducing the villains to mere bullies. I mean yes, the monsters are evil and they murder for the fun of it, but Sloan and Alice? They strike me as far too human to be monsters, and I just didn't feel that they pushed the story far enough into the darkness. I will say though, that ending was pretty dark. I was surprised by some of the choices Schwab made and definitely wouldn't have predicted certain plot twists. Anyway, that probably doesn't make much sense, so I'll try to sum up my thoughts. Our Dark Duet is good. The whole series is good. What makes me sad is that I think it could be great, but the character and plot development fall a little flat. I'm not sure if I'll check out any future books in this series. I probably will, but no promises.